The crosses above Huangpu - The dealers will leave the churches! The dealers will leave the churches! 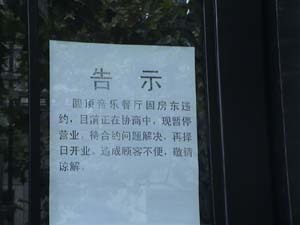 At the end of July, 2004, a number of news agencies distributed an announcement which filled my heart with joy and hope: "The night clubs that were placed in the premises of Saint Nicholas Orthodox Church and the Cathedral of the "Surety of Sinners" Icon of the Theotokos in Shanghai, will be moved out. This was stated by the Chinese ambassador to the Russian Federation, Mr. Liu Guchang, in a meeting with the head of the Department for external church relations of Moscow Patriarchate, the Smolensk and Kaliningrad metropolitan, KIRILL. "From now on, the buildings will be used only for cultural purposes related to the history of the Russian presence in China". The ambassador also assured that the Chinese authorities are ready to organize visits for the Russian citizens to the Russian military burial places on Chinese territory, and they are willing to bring priests from the ROC to celebrate memorial services on the graves of the fallen soldiers. Mr. Liu Guchang has also expressed willingness to develop further collaboration with the ROC". It is necessary to stress that the "Russian Club in Shanghai" (RCS) is among the first to draw the attention of the Chinese authorities and society to this problem. 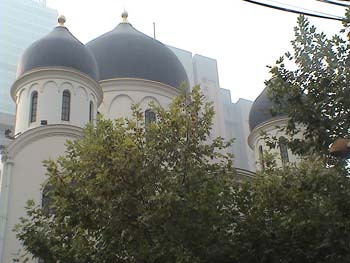 In 2002 we collected nearly 60 signatures from the members of the Russian community and sent them as an enclosure in the letter to the mayor of Shanghai, with the request to intervene personally and help them out with the two Orthodox churches which were transformed into a night club and a French restaurant, but that caused a little confusion among the people. This question for the last two years had not been left even for a minute aside and out of an eyeshot. So many times we brought the question up in the meeting of the Russian Diaspora delegation of Shanghai with Metropolitan KIRILL, so many times we shared our thoughts with the deputy of the State Duma, Mr. K.F. Zatulin, with the deputy minister of foreign affairs of the Russian Federation, Mrs. E.V. Mitrofanova. We mentioned the problem at the Forum of compatriots in October 2003 in Vladivostok too, as well as in thousands of interviews and articles written by the members of the Club, both in Russia and in China. We considered it our obligation to explain this position to the Chinese people, to tell them more about Orthodox Christianity. From the very beginning we had no doubt that the placement of the clubs in the buildings of the churches is not caused on purpose to offend the Russians, it is made by sad mistake due to the absence of necessary information. The very article of the members of the RCS, L.P. Chernikova and Yan Weiming, was published in one well-known Chinese magazine, only in order to fill in this information vacuum. The text titled Rescue Russian Cathedral in Shanghai! laid in the basis of the mentioned article, it is already uploaded on the net. But that doesn't give us the right to ascribe the favorable outcome as our merit. Thanks to the active position of the foreign affairs department of the ROC, the Russian authorities were stimulated to put the question over and over on the agenda of the negotiations. It would be desirable to express gratitude to the Ministry of Foreign Affairs and the General consulate of the Russian Federation in Shanghai which were bringing up this question during all that time. As to the RCS, our efforts helped to direct the turning point for the better, and it was surely not in vain, which gave the members the right to be proud for their participation in this sacred deed. 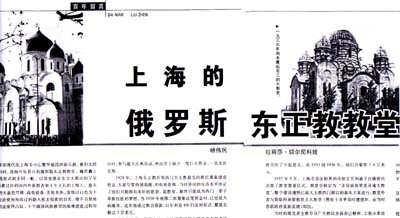 The Chinese authorities intent to give the church buildings a "cultural purpose related to the history of the Russian presence in China" almost completely repeats the suggestion mentioned in the letter that the RCS sent to the mayor of Shanghai, wherein it was written: "Adhering to the principles of the high responsibility before the history and the culture, we think that it would be better off to place a museum of emigration, picture gallery or some other cultural establishment in the church building instead of making a discotheque out of it". From the very moment of our reference to the mayor of Shanghai more than two years passed (and they still talk around that only the Russians are gearing up slowest of all), which is one more reason to thank the Chinese authorities which abided by the opinion of Russia, of the Russian Orthodox Church, the simple Russians. The Decision to "remove the dealers from the churches" - is one more proof for the real rapprochement of our countries, a way to a greater mutual understanding, mutual respecting and friendship above all. The questions how are the things now going on with the churches and what will happen with them in the future are rather expectable. I checked up the churches the other day and I can assure you that the night club is closed down and there is a note hanged on the entrance door with the following words: "Due to the breach of the contract, the night club is temporarily closed down. It will be opened again soon. We apologize to our clients for the inconveniences". On the other hand, the French restaurant which is placed in the Saint Nicholas church, still continues to works. I called the restaurant to make a reservation for dinner but I was told that everything's taken. The manager kindly told me that there are plenty of guests and I should make a reservation few days earlier. Nevertheless, the portrait of Mao Zedong which was left there hanging on the wall from the middle of the sixties was removed. What's next - no one can tell. You can not solve even the slightest problem in this modern world without money. Only heaven knows whether the Shanghai authorities will invest in the further restoration of the temples or not. Still no one knows what will they make of that place. It is extremely advisable for the Russians to propose an option acceptable both for the Russian Diaspora and for the Chinese authorities. In this connection I would like to address the Russian businessmen, and also to all non-indifferent people to render financial support, or to give any suggestions concerning the further fate of the Orthodox church buildings. All offers will be closely examined. And who knows, perhaps there will come the day when above the Orthodox temples of Shanghai the golden crosses will luster again. At the request of the believers of Shanghai with assistance of the Russian Club and the General consulate of Russia, on Nov. 24, 2004 was served a moleben with the akathist of the icon of Theotokos "Joy of all who Grieve" and akathist of Saint John, archbishop of Shanghai and San Francisco, and memorial services too. The service passed solemnly. Father Alexiy served with a big inspiration. There were around 30 people attending and everyone got a gift to remember him to pray. The Consulate for that purpose especially prepared a proper room. The garments, the church utensils and candles were beforehand bought in Russia and brought to Shanghai. The service gave to the administrative building a look of a real little church.